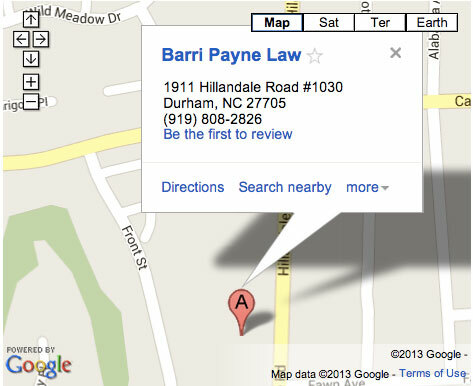 How is child support determined in North Carolina? Is it a specific percentage of the non-custodial parents’ income? No, there is not a set percentage. Child Support is calculated using the N.C. Child Support Guidelines using each party’s income, the child care expenses, the medical insurance costs for the children and any extraordinary expenses. The Guidelines can be found at https://nddhacts01.dhhs.state.nc.us/home.jsp?TargetScreen=WorkSheet.jsp If you and your spouse’s combined income exceeds $25,000 gross per month, the Guidelines will not apply and the Court will look to the children’s actual needs and accustomed standard of living and the relative abilities of each parent to meet the children’s expenses. Can my custody or child support terms be changed later? Yes, if the terms were set forth in a court order they can be changed later upon a showing that there has been a substantial change in circumstances since the date of the last order affecting the welfare of the child(ren). If the terms were in an agreement, they can be changed by an amendment or subsequent agreement or by filing an action with the Court to have the Court enter an order setting forth a different child custody schedule or child support amount. Are retirement accounts considered marital property and can they be divided by the Court? Yes, if they were earned during the marriage they are marital property. This is true even if the spouse did not make any contributions themselves, and all funds were contributed by the employer. If the employment was during the marriage, the associated retirement funds will be marital. The Court can divide retirement accounts such as 401-K’s and pensions by Qualified Domestic Relations Orders (QDRO’s) which direct the Plan Administrator how to divide the account. Whenever possible, however, the Court tries to divide assets “in kind” and distribute entire accounts to each party in an equitable way so that accounts may not have to be segregated. When can kids decide on their own which parent they want to live with? There is no set age in N.C. as to when this can occur. It is in the Judge’s discretion whether to speak to children and give them any input into the determination. Judges vary as to what age children they will speak to. Some will speak to a child as young as 10 or 11 while others are unwilling to talk to children until they are 15 or 16. It will only be one piece of the evidence that the Court considers and will not be determinative by itself. The Court also will not speak to a child in chambers unless both parents agree. Can the Court force my spouse to move out of the home? In certain circumstances this can be accomplished particularly if there is domestic violence or substance abuse occurring. Contact us to discuss this further. Sometimes an amicable agreement to separate can be reached once you hire counsel who can help you assess whether mediation is possible or whether serving your spouse with a proposed separation agreement may help achieve separation as well. What does the Court look at to determine child custody? The Court can consider anything which may be relevant to what custodial schedule is in the child’s best interest. These issues often include: How the caregiving responsibilities were shared during the marriage and since separation; The age, maturity level and special needs of the children; The parties work schedules and lifestyles; The distance between the parent’s homes and the suitability of each home; The ability of each parent to meet the children’s needs and participate in the child’s education and health care; The effectiveness of the communication between the parents; The custodial schedule which has been exercised since separation; The children’s wishes (if of suitable age and discretion); and The occurrence of any domestic violence or substance abuse. What issues can we cover in a Separation Agreement? You can address all issues arising from your marriage and separation except you cannot contract about getting an absolute divorce. You can agree on child custody and visitation, child support, alimony, the division of all your marital assets and debts from large assets down to household furniture, and address tax issues, such as who will claim the children as dependents, and whether you will file or separate tax returns that year and following years.